Okay, we all know this one is obvious. Soda bad, water good. But as always, ignorance is bliss, and people still love to gulp down their uber sweet guilty pleasures, especially if they don’t have a good enough reason to make the switch. So for education sake, we let two arch nemeses duke it out. We want to get to the bottom of why soda can be such a detriment to your health, and why other beverages like sparkling water, flavored or otherwise, can a viable substitute. There are many types of soda out there, so to keep it concise, we’re gonna keep it to regular old cola vs. a flavored sparkling mineral water. One of the most important aspects of this comparison is the contents, so let’s try to decipher that ingredient list first. You can’t really talk about the origins of cola without first mentioning Coca-Cola. Invented by John Pemberton in 1886 as a “brain and nerve tonic” (sounds great, right?! ), the beverage was literally a combination of cocaine from leaves and caffeine from kola nuts. How uplifting! Of course, cocaine is faux pas in today’s beverage industry, but the caffeine stuck around, albeit lowered in concentration in 1916. 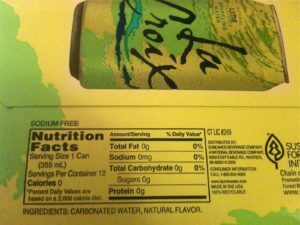 (1) And besides the variation of some of the secret “natural flavors”, the ingredient list hasn’t changed all that much since. Hence, the advent of the modern cola. Today’s actual recipe for Coca-Cola remains a secret under lock and key, complete with its own vault on display. But we can analyze its main ingredients, and thus, the ingredients of most other colas out there. And at 240 calories for 20 ounces, you can blame ingredient #2. First, there’s carbonated water, which undergoes a base filtration process. Although showing their actual mineral content is not a priority for marketing, they do manage to keep the lead and other bad metals out. Although there are many complementary flavors added, it’s the fizz, pop, and tingle in sodas that really keep people coming back for more. Next is a big one: high fructose corn syrup (or sucrose, depending on your ingredient label). 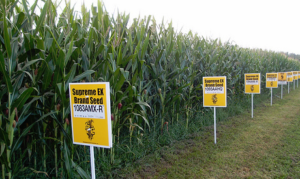 A form of sugar, high fructose corn syrup (or HFCS) from Coke is derived from genetically modified corn. We’re not going down the GMO rabbit hole for now, but we can say there is an obscene amount of HFCS in one bottle of Coke. It’s clear. It’s odorless. It’s acid. 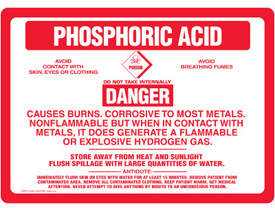 In fact, it’s more acidic than lemon juice or vinegar. (3) Balanced out by the loads of sugar, phosphoric acid is responsible for adding that “tang” to colas. It also removes the rust from tools and car parts. Minus the sugar, of course. It’s one of the industry’s most guarded secrets: what exactly are those natural flavors in Coca-Cola? Pepsi couldn’t reproduce it. RC Cola, never tried it. The truth is, it’s been a mystery ever since John Pemberton made introduced Coke to the world. It could be citric acid with orange, cinnamon, and coriander. It could be that denatured coca leaf still lingering around. One thing’s for certain: the beans on this trade secret aren’t coming out anytime soon. What would cola be if it weren’t for that good old caffeine? In every 20-ounce bottle of Coke is 57mg of caffeine, just over half the dosage of one cup of coffee. Once amplified by its original partner, cocaine, caffeine is now the sole stimulant in Coca-Cola and other mainstream sodas. As far as sparkling water is concerned, it’s a pretty short ingredient list. Even with the addition of brand new flavors on menus and supermarket shelves, the contents are roughly the same. As the saying goes, less is more. And as consumer trends lead more away from soda, we are thankfully seeing more of these sparkling varieties every day. Depending on the source, some sparkling water brands may claim to have a natural balance of minerals that make each source unique. And indeed they are. But if it the label doesn’t clearly disclose its source and which minerals it contains, including pH and specific mineral concentrations, it’s likely plain old filtered city water. As long as that city water undergoes a rigorous filtration via reverse osmosis or steam distillation, for drinking it’s probably right as rain. If you do care about your water, it’s always a good idea to get third-party verification of your preferred water’s purity. Once again, it gets fairly murky when trying to decipher what is meant by “natural flavors”. One guideline is that if it doesn’t have a “Certified Organic” or “GMO Project Verified” icon on the label, natural flavors may be anything but “natural”. But considering the amount used is so minute, it’s generally even a blip on the nutrition radar. If you’re not concerned with such labels, then drink away. If you are, however, it’s good to know that added flavoring, both natural and artificial, may contain anywhere from 50 to 100 ingredients, some solvent and preservatives, which accounts for 80 to 90 percent of the flavor’s total volume. (4) Quite literally, food for thought. Okay, so what does it all mean? The beverages themselves are not inherently good or bad. Drinking one glass of Coke on with a meal is not going to make or break your waistline. A single bottle of San Pellegrino will not hydrate you for the day. Not even the giant one. It’s the habits we form that make up the statistics we’re about to show you. 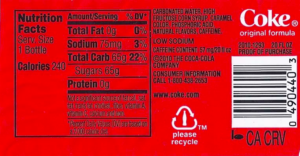 Per the above label, 65g of sugar is just over 16 teaspoons for a 20-ounce bottle of cola. The recommended daily allowance of sugar for men is 37.5 grams, or 9 teaspoons. For women, it’s 25 grams, or 6 teaspoons (5). You do the math. Princeton University fed HFCS and water to male rats at half the concentration of most sodas and guess what, they fattened up like crazy (6). Abnormal weight gain, increase in triglycerides, extra belly fat, you name it. Sound familiar? Speaking of obesity, in every state within the US, obesity is at one-fifth, almost one-third in half of those states (7). According to the CDC, two-thirds of kids in the US drink soda EVERY DAY. Are you starting to see a problem here? Then there’s sparkling water. Looking at the ingredient list alone, there are at least 4 less potentially harmful factors to consider in your daily routine. Let’s say, in this daily routine you drink one sparkling water beverage instead of any sugary soda. Over some weeks and months, the benefit of drinking a cleaner beverage will not only have a better cumulative effect on your waistline but also a lesser effect on your liver, kidneys, pancreas (read: insulin resistance), teeth, and less acidic bloodstream. Also, that full liter of Pellegrino you just downed actually counts as about half of your daily 8 glasses a day, according to registered dietician and author of Belly Fat Diet For Dummies, Erin Palinksi. (8) How’s that for an incentive! So Who Wins the Face-Off? It’s so obvious, we don’t have to spell it out for you. Sparkling water is a clear winner when it comes to healthy alternatives to other sugar and chemical-filled sodas. It’s deceptive, but even a short list of simple sounding ingredients can actually be made up of more complicated artificial ones most likely designed in a lab. Simple is almost always better, and this case is no exception. However, the moral here is not just about ingredients. Habits tend to rule our lives, and the habit of how we hydrate our bodies can either help or harm us. One Coke or Dr. Pepper or even a good old Squirt every once in a while won’t kill us. If indulged regularly, however, chances are good that we may start to feel an effect over time. If you don’t drink soda all the time and have a healthy habit of drinking other fluids like flavored waters or sparkling waters, then you’re ahead of the curve. If you or someone you know drinks soda every day, there’s still good news. No doubt breaking a bad habit is difficult, but replacing one bad habit with a good one can be a more gentle approach. Next time you’re at the convenience store about to reach for that Cactus Cooler, try reaching for a Perrier instead. Your body will thank you.